Back in 2012, The Walking Dead Season One became one of the Xbox 360’s biggest hits. 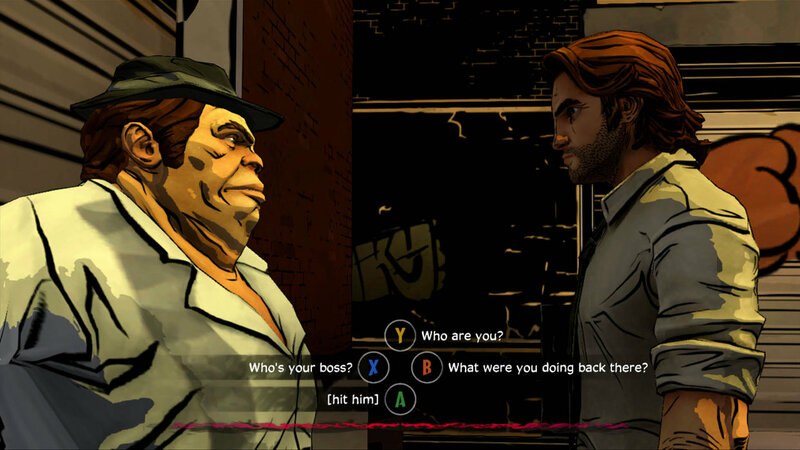 It was such a success that anything coming out with Telltale Games’ name attached has got to be worth a look and that means The Wolf Among Us is a title that just has to be played. But putting its big brother to one side, how good is the telling of the Fables comic book series? Is it decent enough to stand alone or are we forever going to be referring to it as ‘that other game’? Episode 1: Faith should give us a bit of an insight into the world of the big bad wolf and his fabley friends. And if it’s an insight you’re wanting, then from the very first minute you get an awareness of something very special unfolding. Gamers who have previously played The Walking Dead will be right back at home with the point and click nature of the title and the fact that every single choice you make throughout the series will affect both the short and long term outcomes; either for the better, or in my case, mostly for the worse. 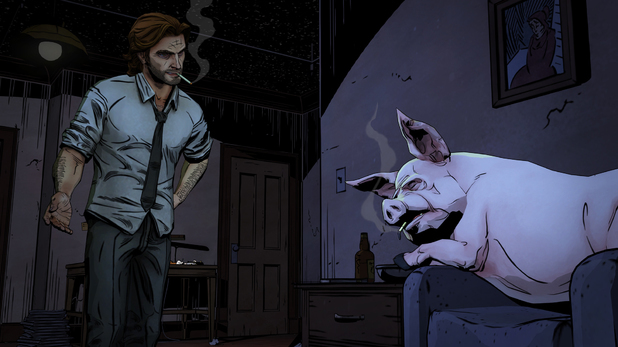 You play as Bigby Wolf, the sheriff of Fabletown and the man who keeps the rest of the ‘fables’ in check. As Wolf, you find yourself visiting numerous parts of the city; interacting and examining both the environments and the other characters to the nth degree, and for the most part finding that each action has a massive consequence on all future actions. As someone who has never read the Fables comics, it was a joy to come across certain characters with Mr Toad, Snow White and Tweedle Dum and Dee all epic highlights. I absolutely love the fact you can hold massively differing conversations with these guys, which see all manner of childhood memories being strangely re-lived. The conversations you do hold can go in a number of different directions. 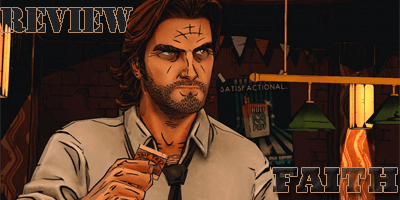 If you so wish Bigby can be the placid polite sheriff, intent on solving the mysteries in front of him in the most complex way, or he can get straight to the point by threatening and intimidating his fellow fabletown residents with the promise of carting them back off to ‘the farm’. Remember though, whichever route you go down on the long and winding conversation tree, it’ll have severe repercussions later on. To break up the searching, cross examinations and the such-like are numerous quick time events. These work reasonably well and are a decent test of the old reflexes as many require perfect timing in order to keep Bigby alive. I say they work reasonably well and maybe that’s a bit harsh because for the most part they work very well indeed, but time and time again I had the feeling that whether I hit the QTE spot on or not, the same outcome would eventually transpire. I also found a little frustration creeping in during dramatic action sequences, when the gamer is required to quickly maneuver some cross hairs over a certain part of the screen. It’s all fine for seasoned 360 owners but give the controller to someone who isn’t quite as quick on the mark and they’ll seriously struggle with these bits. In fact, these quick time events coupled up with some occasional slow-down in the action and annoyingly lengthy loading times are the only issues I had with the game. The story, the amazing art style, the background musical score and the spot-on two hour length of the episode were all near enough perfect for me, with the previously mentioned issues being the only things stopping Episode One: Faith from achieving the highest of ratings. Only time will tell, but with the first episode out of the way, things are looking very promising for the big bad wolf and I for one am more than looking forward to how things will progress further in Fabletown with the second episode ‘Smoke & Mirrors’. Whether it’s currently on a par with it’s big brother, The Walking Dead is hard to say, but it’s most definitely a pleasing start that will appeal to all point and click fans, a good number of adventurers and near enough all comic book admirers. Just remember, not everything is as it first seems in Fabletown.